A footpath through Gloucestershire between Chepstow and Tewkesbury passing through Gloucester, Stow on the Wold and Winchcombe. Mainly on field and woodland paths the Gloucestershire Way undulates for 100 miles through the distinctive areas of the Forest of Dean, Severn Vale and Cotswold, taking a theme of 'Forest and Vale and High Blue Hill'. From the historic border crossing of the Wye at Chepstow the Gloucestershire Way traverses the Forest of Dean, rich in attractive scenery and industrial archaeological history. This first part of the journey culminates on the prominent viewpoint of Mayhill. The River Severn dictates the choice of route, but the ancient crossing of the River Severn at Gloucester provides a focal point for the journey with the views of the cathedral tower across the vale emphasising the transition from Dean to Cotswold. Across the higher ground of Cotswold the walk is enhanced by ever changing views and the variation of pace as the route undulates between hilltop, valley, and village. Stow-on-the-Wold is a fitting height over the surrounding countryside to turn from Cotswold and descend to Winchcombe "ancient capital of Mercia". 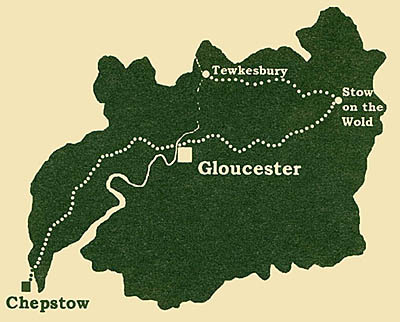 The final stage of the Gloucestershire Way traverses outlying hills of Cotswold to culminate at Tewkesbury, an historic town at the confluence of the Severn and Shakespeare's Avon. "A temendous amount of care has gone into this... It is far more than a guide book, the inclusion of the poetry and snippets of local interest make this a treasure trove whether you are walking the whole route, only parts of it, or tucked into your armchair."